For over forty years, the Saphire family has been helping clients create the events of their dreams. 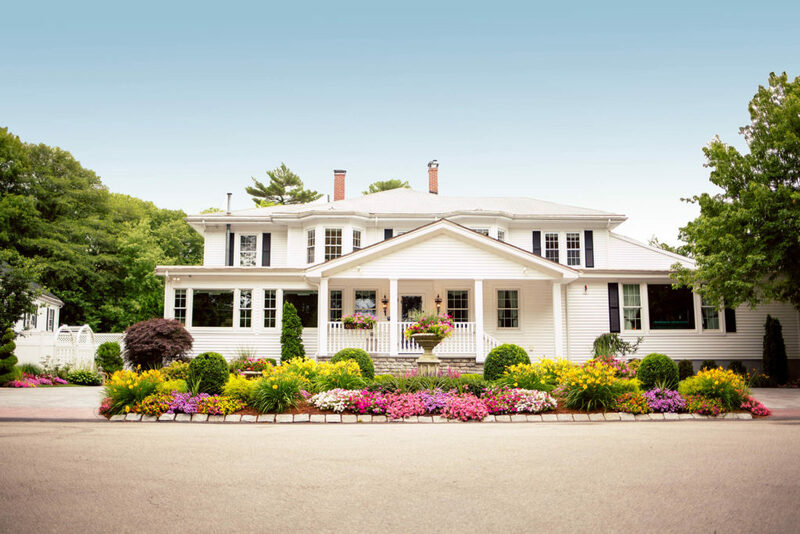 Saphire Estate, the flagship venue for Saphire Event Group, was originally purchased by Roberta and Gerald Saphire in 1977, after the property had caught their eye one day as they drove along Lake Massapoag in Sharon, MA. Originally known as Wentworth’s, then Anapolsky’s, then Daub’s Highland Manor, the property had been built to accommodate the vacationers, tourists, and celebrities who flocked to the area during summer season. Legend had it that in the 1930’s, the great Leonard Bernstein used to perform in the Manor’s grand ballroom. Roberta and Gerald renamed it the Saphire Manor and Inn, soon turning into one of the South Shore’s premier event venues. Roberta & Gerald Saphire in front of the Inn building on the Saphire Estate property that they originally purchased 40 years ago. In May 2006, their son Jonathan and his wife Amie took over ownership of the property. They invested nearly one million dollars to remodel the house and gardens, retaining its historic charm, while incorporating the latest in appointments and amenities and relaunched it as Saphire Estate. Since then, it has become renowned throughout the southeastern Massachusetts area, winning countless awards from the top wedding sites, as well as local and regional publications. Saphire Estate has long been known for its breathtaking lake shore views, a romantic courtyard perfect for outdoor ceremonies and cocktail hours, and the exclusivity of hosting one event at a time, ensuring clients that a wedding held there is truly “their” day. But beginning in Fall 2018, Saphire Estate will debut a brand-new space on its property that will truly make it the ideal venue: a 2400 sq. foot designated interior cocktail space! The Saphire’s have worked with the Town of Sharon, architects, and designers for the last three years to get approval to renovate the existing Inn on the property (the building off the courtyard) to have a separate cocktail space. After a long road, permits were secured and construction began in December 2017. Day one of the demolition process of the former Inn building. 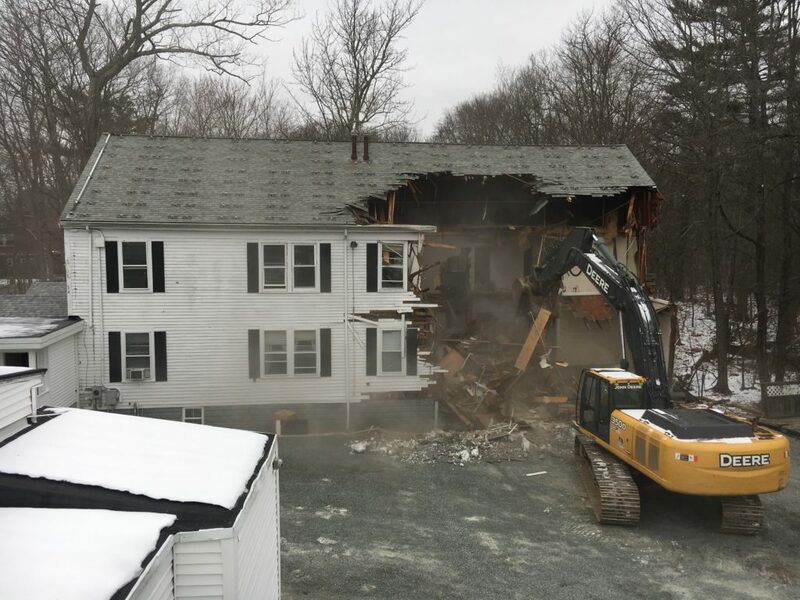 Instead of renovating the existing structure, the decision was made to tear it down and build new to ensure that the building would be fully up to code and serve future clients in the most functional and aesthetically pleasing way. 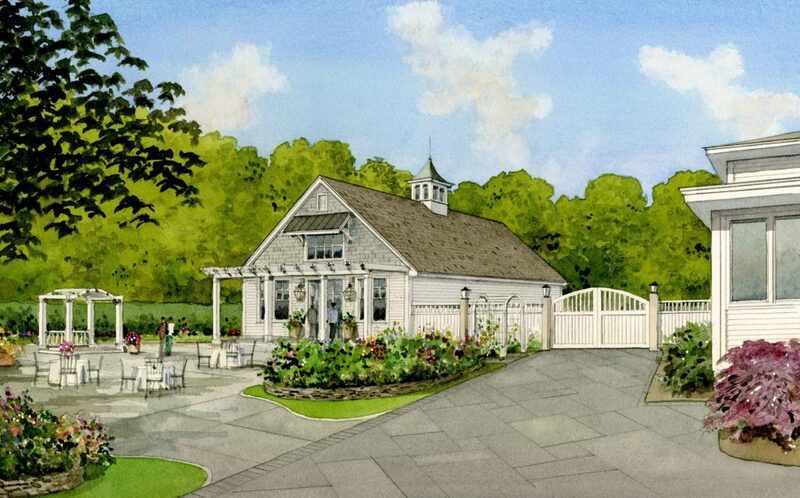 The exterior of the building, including landscaping, siding, and anything that will be visible when on the grounds of Saphire Estate, will be complete by approximately mid-March 2018 to ensure no outdoor ceremonies or photographs at upcoming weddings will be impacted. The interior will be complete by Labor Day 2018, just in time for the fall and cooler months that follow. 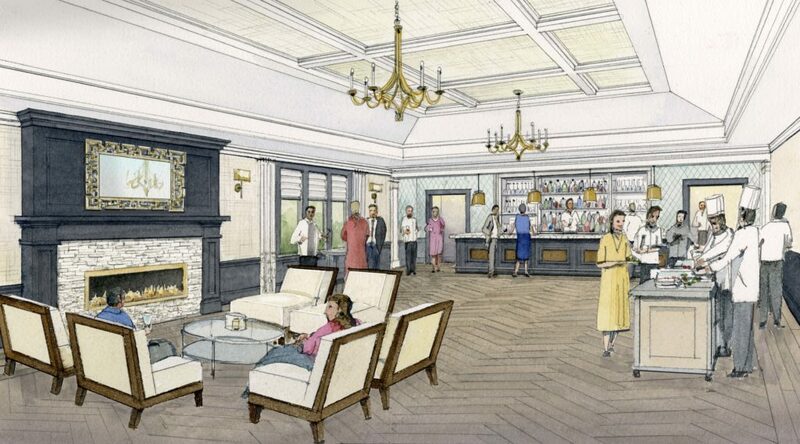 A rendering of the new interior cocktail space at Saphire Estate. The interior of the cocktail space will showcase some unique features like a limestone fireplace, custom chandeliers, a caesarstone bar top, and more. Elements like patterned drapery, linen wall coverings, and dark oak millwork will retain the classic beauty of this quintessential New England estate, while incorporating modern upgrades and design choices. Over the next few weeks and months, we invite you to follow along as we share weekly updates on the construction, decor, and so much more. We can’t wait to show you the completed project later this year! In addition to featured blog posts, you’ll find the most current updates on our social media accounts, including Facebook, Twitter, and Instagram. Stay tuned for lots more to come at Saphire Estate, and watch this space for more updates!